I hope you all had a great weekend! It was so beautiful here in South Carolina and I couldn't help but break out the flowy crop tops. I've always loved distressed denim and there's just something about pair dark, ripped jeans with white that is pure perfection to me. And of course, adding a pop of color (or two) like these beautiful Manolo's in glass blue. I ordered these last week (Saks Sale!) and could not wait for them to arrive. SJP, or should I say Carrie Bradshaw, made every girl fall in love with Manolo's, right? Oh how I love this look! 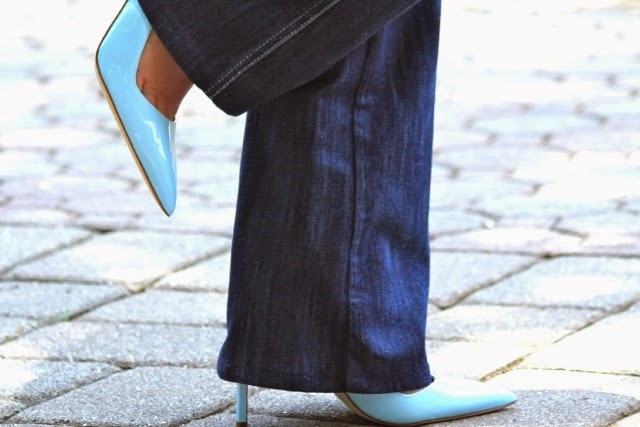 I would call this my signature ... a cute top, great pair of jeans, and amazing heels! You are rocking it! And, yes, we can all thank Carrie Bradshaw! So cute! I love the crisp white against the dark washed denim...very summery! I am loving those pants! It's so refreshing to see non-skinny jeans every once in a while! Love this look! Those jeans and top pair perfectly together! Eeeeek! I love these jeans so much. They look so flattering with the flowy top!